Sumiyoshi-taisha Shrine in Osaka was built 1,800 years ago to serve as the main shrine of over two thousand Sumiyoshi shrines across Japan. Sumiyoshi shrines enshrines the Sumiyoshi Sanjin that are regarded as gods of sea and sailing. They are worshipped by people in the fishing and maritime industries. The shrines are therefore usually found close to harbors. The present main shrine was built in 1810. 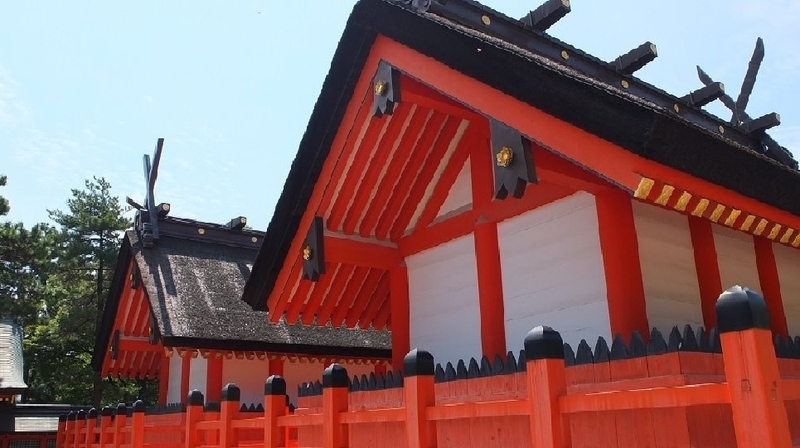 The main shrine consists of four buildings facing the ocean towards the west, which is one of the oldest historical architectural styles of shrines and is called Sumiyoshi-zukuri. The structure is designated as a National Treasure. During New year days, more than 2 million people visit to the Shrine. The Sumiyoshi Festival is held over three days. A highlight of this festival is the nagoshi-harai-shinji ritual on the middle day. The nagoshi-harai-shinji ritual involves women and children in the Muromachi period (14-16th century) costume going through a large straw ring. You can also join in this ritual to wish for good health. The Moon Viewing Festival “Kangetsu-Sai” at Sumiyoshi Taisha Shrine must be worth visiting. A celebration ceremony takes place at the main palace and then a moon-viewing festival, the exceptional religious rituals is held when the beautiful full moon rise above the Taiko-bashi, curved bridge.